Serviced by an Uptown-Downtown shuttle, the Douglas Corridor is an affordable, walkable community in which people live, play and work. While the area is host to a rapid transit system moving people through and beyond the region, the area is no longer dominated by vehicular through-traffic. 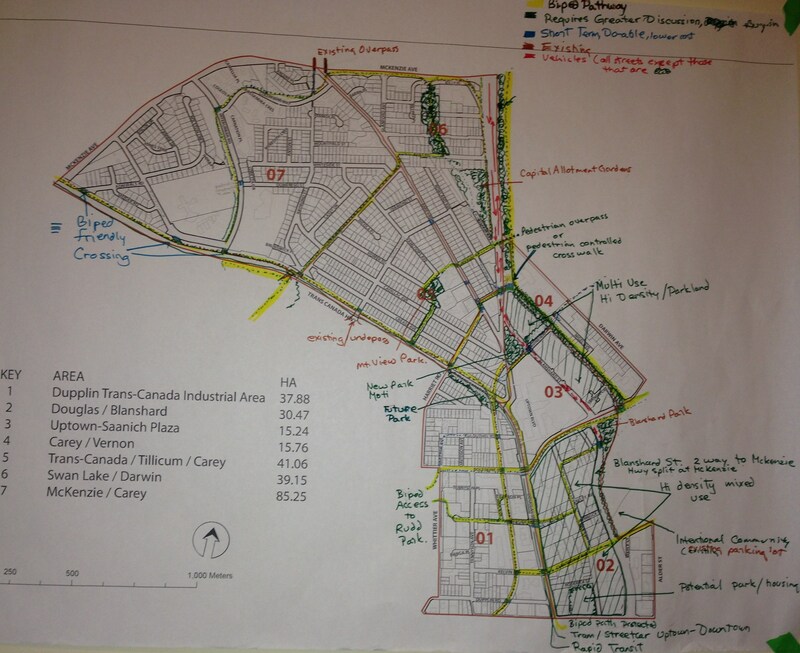 Planning for the area is regional, led jointly by Victoria and Saanich. A residential address here is affordable and inviting; plenty of green space, assorted parks, day-lit creeks and other natural amenities combine with welcoming gathering places to foster a strong sense of community. There is a pleasant sound ambience. The area boasts a vibrant mix of employment opportunities in the retail and restaurant sectors as well as the arts (live music and theatre), entertainment, technology, light industry and other commercial ventures. Neighbourhoods within the area are connected by a continuous network of separated bike and walking paths that ensure both good walking routes for people of all abilities and safe commuter cycling routes. Residents have easy biped access to regional transit routes, local businesses and micro-green spaces as well as more green distant attractions such as Swan Lake or Rutledge Park. All biped pathways are separated from the road. Links to documents including vision priorities, map photos, summary of highlights and next steps can be found below under the "Proceedings" headline. Thanks to all those who attended "From Nowhere Special to Someplace Great". 45 people participated, giving input on an overall vision for the area as well as specific ideas for action in 4 key areas; green-space; mixed use density; an interconnected active transportation network; people power, or public engagement. Following the CRD sustainability strategy's suggestion of taking “bold approach”, the event focused on a near term, 10 year future.